There is no way to eloquently translate this into English, although I suppose ‘Tofu Flower Lady’ certainly does not rank among the most terrible translations I’ve heard, not by far. As I mentioned before, we hiked up to the Lamma Island wind turbine through less-traversed back-roads, and so on the way down we decided to cruise along the large, main road. Towards the bottom were several rest points, where in America would probably just be a drinking fountain and maybe, just maybe, a port-a-potty, but here in Asia nestled a canopy of food stations. What do I call this, it’s not street food, so…trail food…? 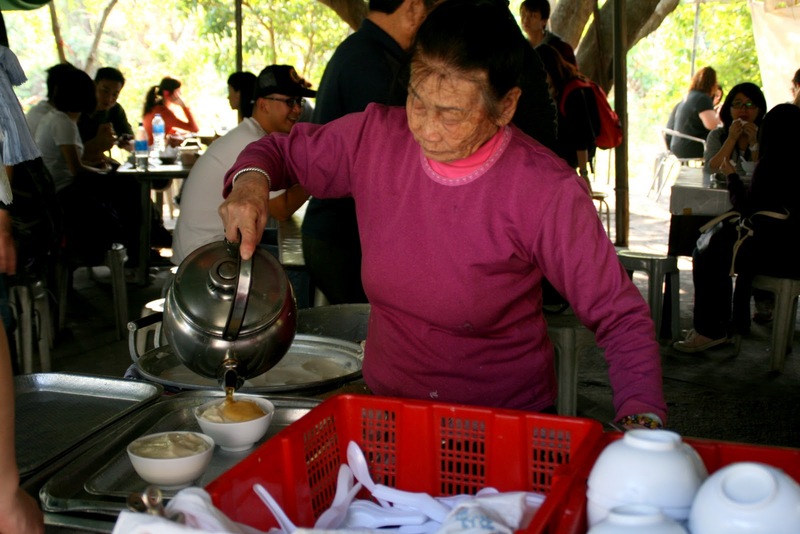 Anyway, always pulled between whether to stop and eat or to keep going (a lifelong struggle, I swear), I just had to stop when I saw this old woman serving up bowls of Douhua (豆花). 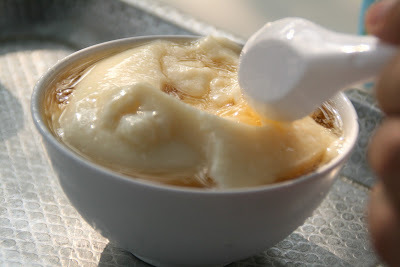 Among the few traditional Chinese desserts is douhua, or doufuhua, which directly translates into ‘tofu flower’. 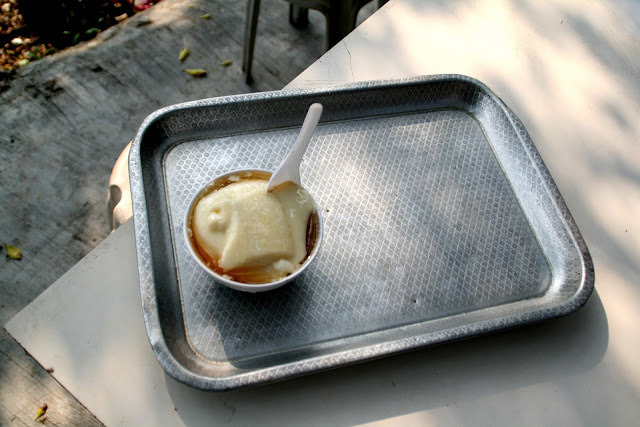 A simpler dessert could not have been thought up, as douhua is made with scoops of ultra-soft tofu, coated with a ginger (or plain cane sugar) syrup. Sometimes, to kick it up a few notches, some will add peanuts or redbeans or any number of garnishes. Growing up I think I had it plenty of bowl-fulls of douhua with lotus nuts. 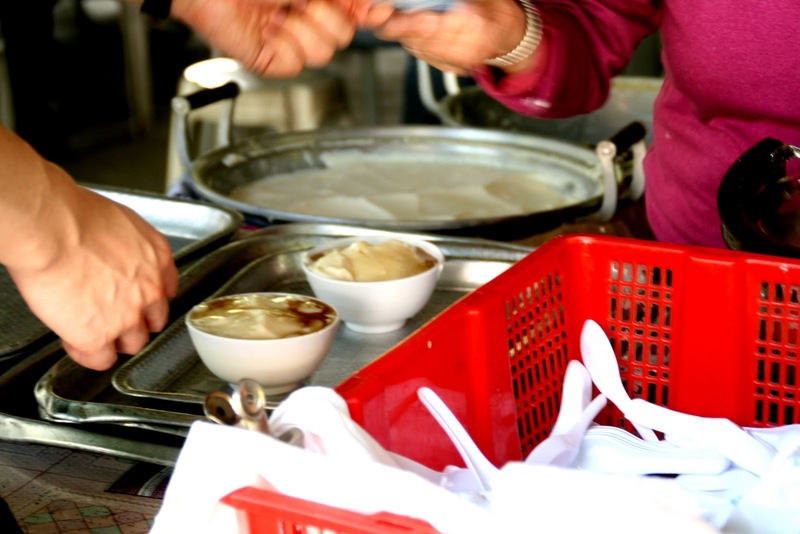 But real douhua, the authentic street kind, is usually consumed in a cheap china bowl with nothing but sweet gingery syrup poured over the top. Traditionally douhua is served cold during the summer, and warm during the winter. 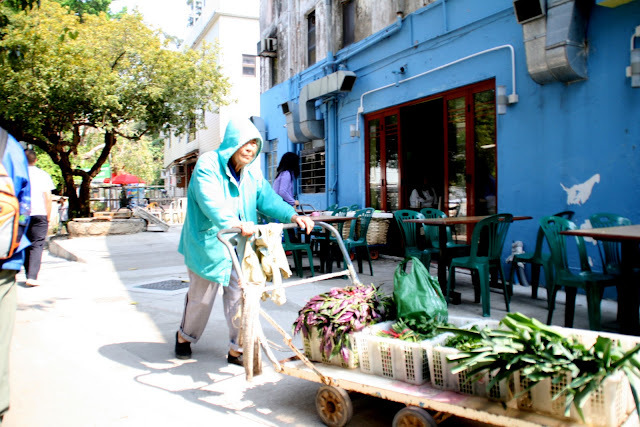 At Lamma Island, we had the option to choose, and after a long day of hiking through an island what do you think we opted for? I love this stuff because it goes down so smooth, and has the amazing ability to cool (or warm) you from the insides. I also love it for its simplicity, for its sweetness, and for the lack of effort one needs (no chewing necessary) to down the entire bowl! I’ll include a more substantial of a post on Lamma Island tomorrow, but for now, here’s a sneak peak of the sleepy island culture we observed over the weekend. It’s amazing to think this lush, jungle-like fisherman’s island is just a ferry-away from Hong Kong. 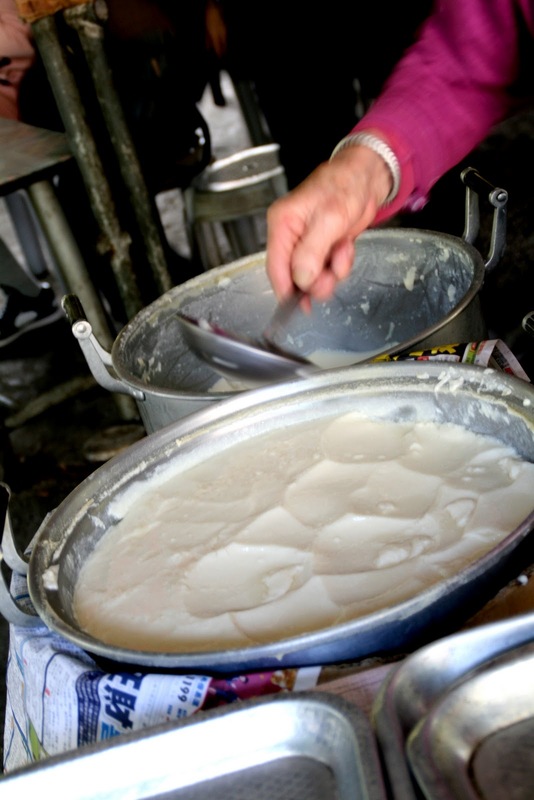 Sugar Cane is a big treat in China, and many other asian countries as well. Look how big this stuff is- like edible bamboo stalks. Most of the time it’s sold, on the street, off of a cart. The vendor will hack you off a stick about a foot long, and using a small machete that looks like a rasp, he will shave off the hard, outer bark leaving you with the soft, sweet, yellowish-white flesh. But it’s not just to be eaten- sugar cane flesh is veiny and fibrous, and you chew a bite as you would a stick of gum, spitting out the stringy fibers (usually on the side of the road).